Have fun with figurative language with these Halloween exaggerations that are sure to spook your students! Your fourth graders will enjoy the chance to write their own hyperboles with these over-the-top sentences. 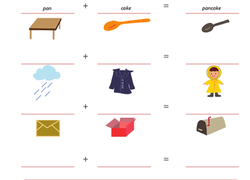 To complete this printable your child will look at the pictures and then identify what they are, which will help to give her reading practise. Use this glossary with the EL Support Lesson Plan: Figuring Out Tricky Words. From seed to flower to vegetable, take a look at the cucumber with this coloring page and brush up on English and Spanish vocabulary! These sentences are missing some pieces. 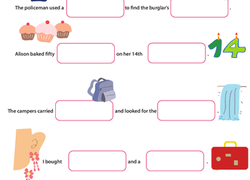 Can your second grader fill in the blanks, using the images above each sentence as a guide? Your fifth grader will learn impressive words like "tenacious" and "strident" in this vocabulary builder worksheet. Learn some new words with this worksheet. 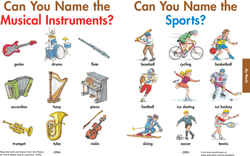 Can your second grader choose the correct word for each sentence? Each sentence contains a word that sounds right, but is spelled incorrectly. Here is a fun language arts challenge for kindergarteners: a Russian alphabet sheet! Your child will learn how to write and say a few words in Russian. From seed to flower to vegetable, take a look at the onion with this coloring page and brush up on English and Spanish vocabulary!